We have recently renovated our salon's interior. 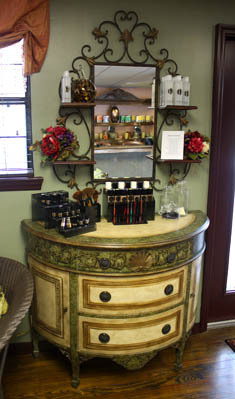 Please take a glimpse of our facility and drop by for your next salon and spa needs! Providing a total salon experience for more than 20 years! 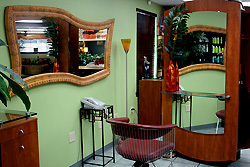 Reflections by Sissy is a hometown salon with city flair. Originating in Bay County, they can provide you with a thorough and exquisite approach and solution to all your beauty needs. Reflections by Sissy, located on the curve in St. Andrews, is a visual asset to the historical renovation in the St. Andrews and Panama City area. They cross all salon boundaries with their combination of multi-functional services to feed all of your beauty and self-esteem needs. They make it a point of offering their clients a full collection of services that won�t serve just to enhance your appearance, but also your inner beauty. They know that if you look good from the inside out, life is much more fulfilling and rewarding. Sissy Cowart, owner and lead stylist of Reflections by Sissy, has been in the salon business since 1984. With her extreme motivation, dedication and perseverance she has excelled in every category of head to toe personal, body surface renovation. Sissy�s accomplishments are outstanding by any standard in the industry. Her business falls under a personal resume that includes but is not limited to the following: Membership with the National and International Training Group, schooling in Europe with Tony and Guy, Goldwell and Schwartzkoph, as well as an extensive accent in permanent hair color treatment which was attained at IBS in New York, Color USA, as well as Paul Mitchell Academy where she received her Master´s Stylist Diploma in hair cutting, styling and coloring. Sissy serves as a diplomat with the American Council of Dermagraphic Research; She has been accredited by several respected institutes in the Permanent Cosmetics field including the Society of Permanent Cosmetic Professionals and the American Academy of Micropigmentation. She is also Derma-Medical and Paramedical certified. "Sissy has excelled in every category of head to toe personal, body surface renovation." To add to the already prestigious r�sum�, Sissy has been an educator for several national and international manufacturers, specializing in hair color. She participated in Hair Color USA, a national congress of hair colorists where the top hair colorists join all major hair color manufacturers to exchange the latest and the best in hair coloring and corrective coloring technology. You may have also caught Sissy on a weekly presentation on television, which featured a complete makeover, or speaking for local civic groups such as the American Cancer Society and the Look Good Feel Better Association. Sissy currently resides in Bay County and has three children, one of which is fellow Reflections by Sissy stylist, Nikki Lipford. Nikki Lipford has been in the salon business since 1998, however, has been around the salon business her entire life. Nikki, a third generation stylist, is nationally trained in color and corrective color. Her resume includes but is not limited to the following: training from the New York Soho Academy, cutting classes form Tony and Guy, Graham Webb and American Crew. Nikki has also served as an educator for Schwartzkoph Color Company for five years. Nikki has also had schooling at Paul Mitchell Academy and in Goldwell color techniques. "...Nikki, a third generation stylist, is nationally trained in color and corrective color." Adding to her strong hair care background, she also specializes in many skincare techniques such as facials hyperpigmentation, acne treatments, body wraps and microdermabrasion. She received her certification at the Repechage Academy in Secaucus, New Jersey under the guidance of Repechage founder and CEO Lydia Sarfati. Nikki continues to give back to the community through her work with the America Caner Society and the Anchorage Children�s Home. She also currently serves on the Cosmetology Board at Haney Technical School. She successfully trains all Reflections by Sissy assistants, further providing a smooth transition from cosmetology school to daily salon operations. Nikki resides in Bay County and has one child. Tom is a licensed massage therapist with 9 years of experience. He graduated from Soothing Arts School of Massage in Destin Florida.He is also certified through the International Institute of Reflexology. Tom is also a member of the Florida State Massage Therapy Association (FSMBA). Prior to becoming a massage therapist he was a registered nurse working in the intensive care unit for 30 years. Tom's mission is to support individuals in achieving life balance through personal wellness benefits of massage while relieving physical as well as emotional stress and strongly believes in massage as a viable modality for enhancing overall health and well-being.